Opening Hours: 11.00a.m. – 10.00p.m. Ticketing Counters Opening Hour: 10.00a.m. – 9.00p.m. 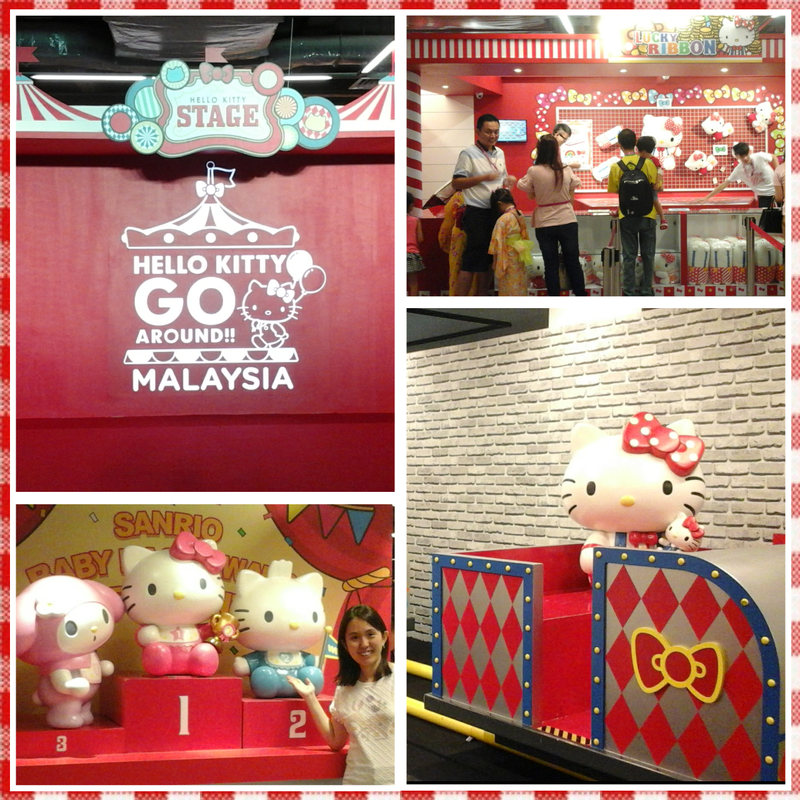 The Hello Kitty Go Around (Malaysia) Carnival is finally in town! It's on-going for an entire month throughout this school holidays/year end right up to mid January next year. 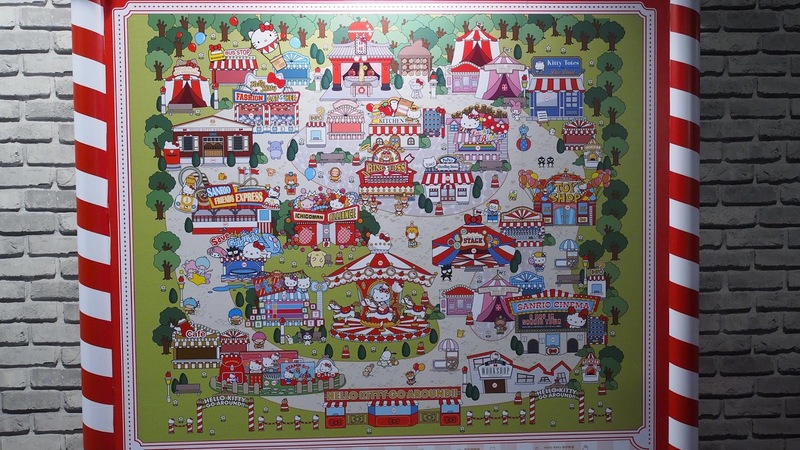 The carnival is certainly something that Hello Kitty fans wouldn't want to miss! Each normal ticket comes with a special design lanyard while for special day e.g. Christmas, Christmas eve, new year and Melody day, there are different limited edition designs of lanyard and a non-woven bag included that you can't find else where. 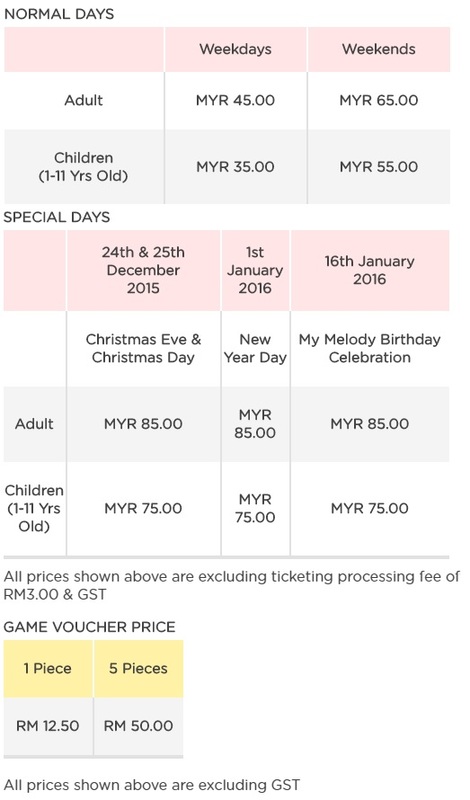 I'm grateful to receive 2 weekday complimentary tickets (does not include any game vouchers/name tag with Hello Kitty landyard) from Heyday PR, which I gladly entered the carnival together with my mum after some shopping in KL. One of the most fascinating yet 'shocking' thing that I came across was at the "Apple Temple". Carnival atmosphere at this part of the event was definitely non-evident that I didn't realize it's a games booth! 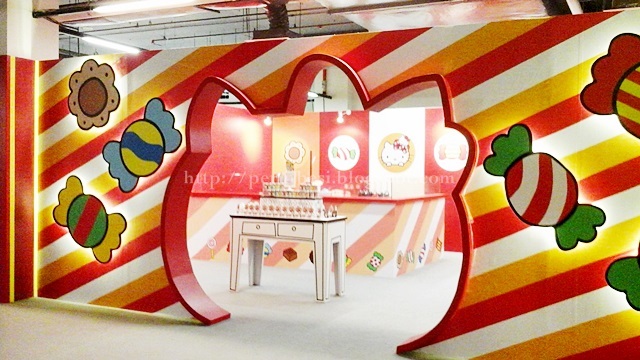 I seriously thought that it's just an area for photo opportunity & what made my eyes pop was the Hello Kitty right at the center of the 'altar'...hahaha...since when was Hello Kitty a god that's worshiped?? 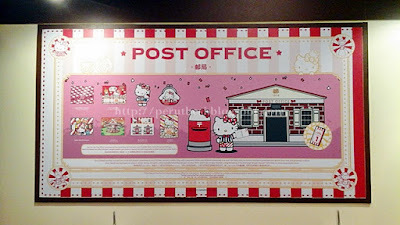 Anyway, I just found out that it's a games booth where you can win a Hello Kitty "ema" (traditional Japanese wishing plate), which you can hang it on a designated wall, of which, this silly me didn't snap a photo of it since I didn't know what's this whole area about! *lol* I actually saw like 1 or 2 ema hanging on a wall, but that's about it...feels kinda sad! 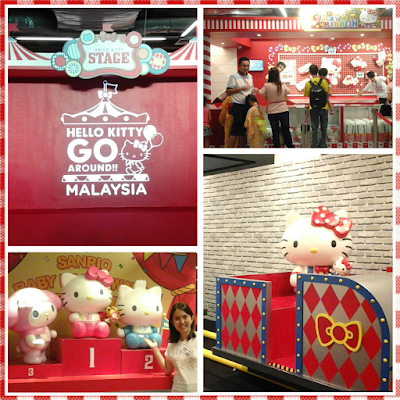 Fans, enthusiast & children will enjoy this part of the carnival as you get to purchase a tote bag (I think it costs RM20.00/tote bag) & stamp all sorts of Hello Kitty images on your bag! 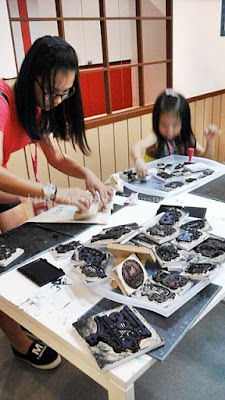 You can even stamp your name on the tote. Sounds like some fun here, eh? 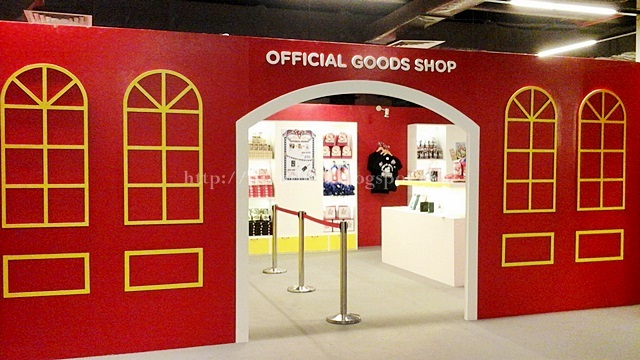 You'll find an Official Goods Shop inside the carnival grounds as well as official merchandises upon exiting the carnival. I'm not entirely sure if the items sold at both shops are the same, but from what I glanced through, it doesn't seem to be the same. 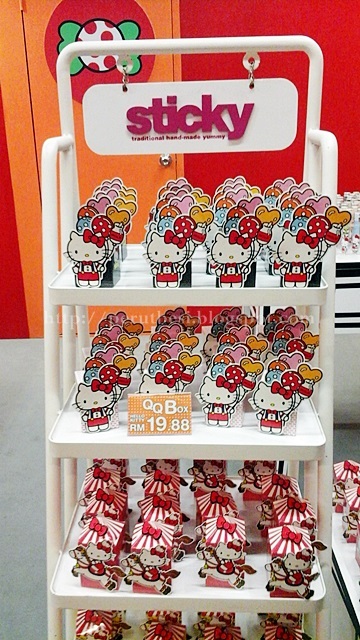 How about some Hello Kitty printed sweets as well? I reckon Hello Kitty fans won't want to miss this. To add to the fun, you can also spend some time to get yourself more Hello Kitty goodies here at the workshop. 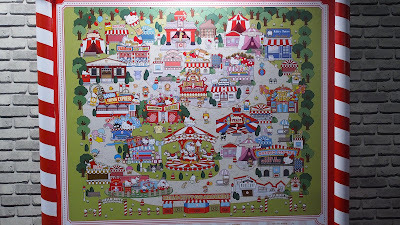 Craft work was part of the workshop; you can check out the prices at the workshop itself. Before leaving the carnival, you can collect/purchase photos that you have taken earlier at the "Hello-Kitty-Go-Round" or random photos taken of you around the carnival at the Photo Shop. 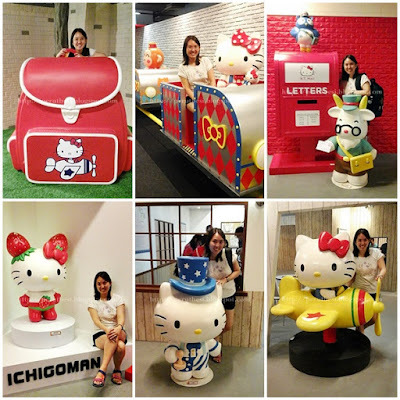 Ok, I have to admit that I'm not an avid fan of Hello Kitty, although I love Hello Kitty since I was young. The fact that all genuine Hello Kitty merchandises were too costly probably dampened my mood & chances of getting hold of any merchandises since my childhood. My only recollection was my sister's Hello Kitty plushie (quite a hugable size), my My Melody jewellery box & the few Hello Kitty plushies that my sister used to buy from McDonald's. Yeap, it seems as if she's more of a Hello Kitty fan than I am, also because I'm not very generous when it comes to buying toys for myself since they're of no major use apart than decorative purposes. 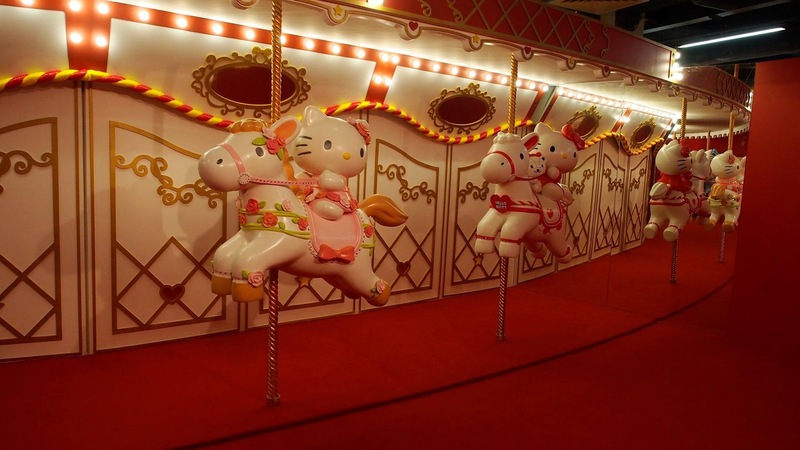 I guess Hello Kitty fans will still find this carnival rather enjoyable since they would be willing to spend on Hello Kitty merchandises & games. The carnival has quite a number of photo opportunity areas as well, although I still feel that compared to the carnival in Singapore, this is probably just 3/4 of all the colorful icons/figurines. 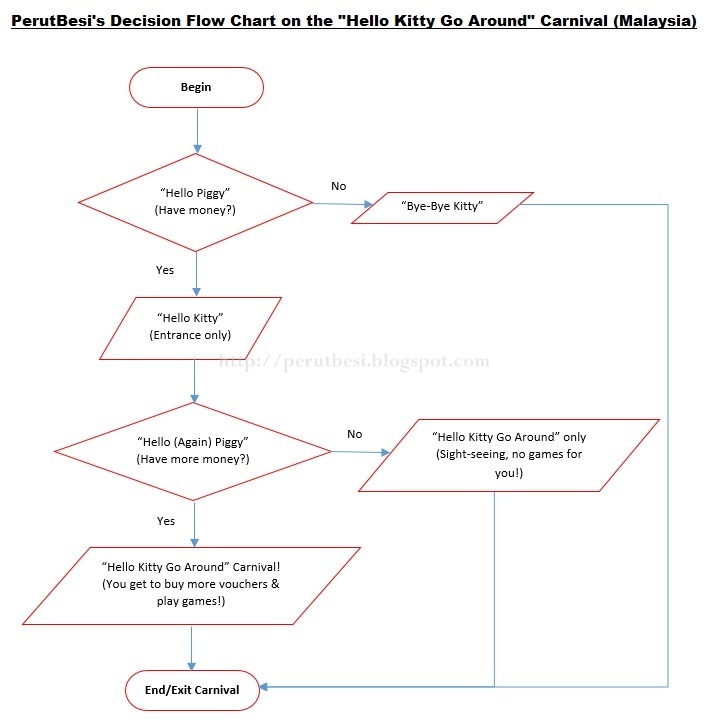 From a stand-point of need vs want & value vs total amount of money-spent (considering the current volatile economy of Malaysia), I personally will think twice (or thoroughly) before spending my finances on this carnival. 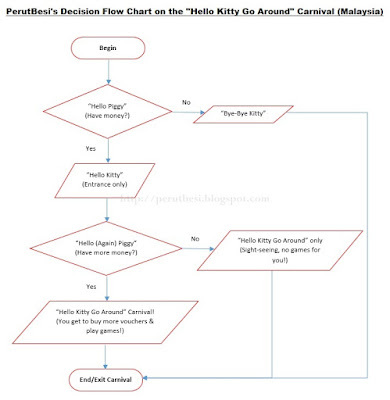 Such things are certainly one's choice & decision, according to financial abilities, so if you really fancy Hello Kitty & you're willing to spend the money for it, go all out to enjoy the carnival as it'll only be around 'til 19th January 2016! Get your tickets asap before they're sold out! "Best of North & South Indian Cuisines"
Brickfields is no stranger when it comes to a variety of Indian cuisines. It's not called "Little India" for no reason, eh? The traffic here & parking can be quite a challenge, but thankfully, Aroma is located near the Bank Rakyat building, so you can still opt to pay for an hour or two of parking for a good meal that you won't want to miss out. It was thanks to Food Panda that I had the opportunity to try out Aroma Restaurant's fantastic food. It was an Aromatic Dinner date, no doubt! Each month, Aroma Restaurant will introduce some promotions/new dishes, so for October - December, the below are their featured dishes. This is a WINNER! I've never had such a delectable lamb dish! This flavorful lamb dish from Patiala southeastern Punjab in Northern India is so creamy & rich from cashew nuts & almond, tastes sweetish, has a honey sweetness smell & goes extremely well with breads like the Kulcha. The lamb chunks were really tender yet not 'disintegrated' until there was no 'chew'. Ah...I'm missing this dish so much! Who would have expected that cauliflower could taste so delicious when deep-fried with some spiced batter? It's a great snack, appetizer & dish that is slightly spicy &very aromatic with the variety of herbs & spices infused into the batter. The dish is named "gobi 65" as the chef would cut the cauliflower up each time to exactly 65 pieces! *whoa! * Apparently, this is a skill. Of course, if you were to replicate such a dish at home, you may not achieve such precision...haha. This dish is best enjoyed by itself or with some of Aroma Restaurant's mint chutney! Mint n coriander sauce/chutney with a hint of chili padi. LOVE IT! It goes well with papadam too! Kulcha is a type of leavened bread (curd, baking soda and baking powder are used instead of yeast) eaten in India and Pakistan, made from maida (wheat flour). It is particularly popular in India and Pakistan, and is usually eaten with chole (chickpea curry). Here at Aroma Restaurant, a piece of kulcha (quite large) is cut into 4 pieces. I enjoy such kind of flat breads, especially when there's gravy to go with it! Interestingly, this is a south-west Indian dish! It looks more like a northern Indian dish to me since it's not the typical red/orange-colored, spicy southern Indian curry. The hard-boiled eggs are cooked with ginger, garlic, tomatoes, onions, green chilies, turmeric powder, coriander powder, curry leaves, garam masala & thick coconut milk among the few main ingredients. What you get is a creamy gravy with hard-boiled egg that is OH-SO-YUMMY! Another Punjab dish, which was surprisingly delectable despite it looking very plain is this chicken Nawabi tikka. This moist & gently spiced kebab is flavored with mace (dried, outer aril, enveloping firmly around the nutmeg kernel) & grilled in tandoor. Thanks to the intense aroma of mace (rakes a higher price & has a special place in the kitchen spice box! ), the usual chicken tikka is brought to the next level. If no one tells you that it's fish, you would have thought it's chicken breast meat...hahaha. Cubes of boneless fish marinated in yogurt & exotic spices are barbecued in the tandoor clay oven. It's best eaten with the mint chutney! Aubergine is widely used in Indian cuisines. The aubergine masala consists of diced aubergines, stir fried with coriander leaves, tomatoes, ginger, cumin seeds & Aroma Restaurant's "chef's own masala sauce"! I love soft & perfectly spiced aubergines, so this was just right for me. I've never really fancied Indian desserts as I don't have a sweet-tooth. Milk dumplings in sugar syrup? Hmm...I just gave it a try, thinking that I wouldn't like it since I've never really fancied gulab jamuns, but hey, I actually finished this & liked it compared to the carrot halwa! It's not too sweet 'til the sweetness stings your tongue & when eaten warm, it's actually quite tasty. I've never liked carrot halwa & I still didn't like it although my friend loved it & finished up both our shares! We swapped desserts - I ate up her gulab jamun & she helped me finish up my carrot halwa...hahaha. Perhaps carrots + sweet condensed milk just didn't work for me. After an exotic & gastronomical journey around India in ONE meal, it was just comforting to sip on a hot cup of masala tea. Traditionally, masala chai tea consists of spices like the green cardamom pods, cinnamon sticks, ground cloves, ground ginger, and black peppercorn together with black tea leaves. If you sip on Aroma Restaurant's masala tea (with fresh cow's milk) slowly, you'll be able to taste each spice sip after sip. I managed to pick out the cinnamon, cloves, ginger & black peppercorns after a few sips - it was delightful! I thought that day ended well - what's not to love about good food, good tea, good ambiance & new found friends? Food Panda provides delivery within an hour for just RM8.00 (delivery fee) with a minimum order of RM15.00. You can browse through Aroma Restaurant's menu on Food Panda's website & begin your gastronomical journey right at the comfort of your home or at the convenience of your office! Have a great one! Business hours: Daily 10:30a.m. - 10:00p.m. Tucked in a rather new area (at least to me) of Bandar Bukit Raja Klang lies this Hakka gem to be discovered. This restaurant serves Hakka & non-Hakka dishes that are close to the heart of its owner, Chong How. Frankly speaking, opening a Hakka restaurant in the Hokkien dominated area of Klang doesn't sound like a great plan, but I have to say that Chong How made a good decision to offer a different variety of food option to residents in this town & its neighboring areas. The restaurant has been opened for approximately 7 months with an increasing variety of dishes being introduced to its menu since Chong How & his team enjoy creating new dishes & innovating home-cooked dishes that are much loved by Malaysians. Flavors have been tweaked & toned-down to suit the palate of Klang residents since they're the bulk of his customers as traditional Hakka flavors tend to be much bolder, which Hokkien clans aren't used to. This is one of the best innovations ever! The salted egg craze seems to be in town & I think Good Hakka Restaurant nailed it with their taupok version! It's REALLY crispy on the outside (the taupok is turned over & deep-fried), well coated with the creamy salted egg yolks & not soggy at all (dry & crispy coat, but oh-so-delicious) & not dry on the inside. Ah, blogging about it now makes "my mouth water"...my favorite! My 2nd favorite dish! In my opinion, this was the most "umph" dish served that evening as it was not just spicy but fragrant. I would much prefer if there is the aromatic kaffir lime leaves in their home-made sambal paste, but I guess the dish is flavorful enough to be enjoyed with just a bowl (or two) or plain white rice. The squid rings were chewy yet tender & oh, the generous serving of petai makes the heart of petai-lovers leap with joy! It's a dish cooked with passion; the assam paste has to be fried for an hour (has the evident aroma of kaffir lime leaves, lemon grass & lime) before adding to the Rompin blue tail prawns to be served as the assam prawns dish! Fresh & delicious. The Hakkas are well-known for their pork+fish paste yong tau foo. Unlike the usual Ampang yong tau foo that you come across with just fish paste stuffed into vegetables/bean products, the Hakka-style yong tau foo has a slight variant in taste, texture & ingredients. Chong How ensured that the Tenggiri/Mackarel fish meat is hand-scraped before adding in the minced pork, Tenggiri salted fish (yup, not the "mui heong" type as that will over-power the natural taste of the other ingredients), fried shallots, sengkuang/turnip, & sesame oil, just to name a few of the ingredients in the stuffing. This recipe took 4 months to achieve perfection! It takes 40 days to make 1 batch of wine & yes, Good Hakka Restaurant makes their own red wine for their red wine chicken! A LOT of wine is used in cooking this dish as the chicken has to be cooked for quite some time & alcohol evaporates, so more wine needs to be added to give the dish an evident wine taste. Having said that, as a typical Cantonese, I felt that this dish still lacks wine and the taste of ginger! Gosh, I'm like some pregger/woman who have just given birth! Hahahaha...bring on the wine & ginger yo! I'm too used to my mum's style & the Wong family's style of Hakka-style braised pork although it may not be authentically Hakka. Being so used to the pungent flavor of the red & white fermented bean curd taste, I felt that this version is way toned down. I think it's my 1st time tasting this Hakka-style braised fish. According to Chong How, you can use any fish, but in his opinion, the Tenggiri/Mackarel still tastes the best. This dish has a little bit of wine, dark soya sauce, "min see"/bean paste, & Chinese cabbage to give a lovely, naturally sweet taste to this simple 'stew'. I didn't find this dish very appealing since it wasn't an authentic Hakka dish nor was it extraordinary. The 'Ma Yaw' fish had a slight mud-smell, so I didn't enjoy it as much. As for the sweet & sour sauce, I don't have much to complain nor will I rave about it since it's 'okay'. Most ice lemon teas are English/Ceylon teas + lemon, but here at Good Hakka Restaurant, Chong How is proud to introduce his much loved Pu Er tea as the base for his ice lemon tea! It was yums! I was pleasantly surprised & if not for a full tummy of good food, I would have ordered another glass of this tea! So fragrant! Quite a decent variety for a humble establishment, eh? Business hours: 12:00p.m. – 3:00p.m., 6:00p.m. – 10:00p.m.